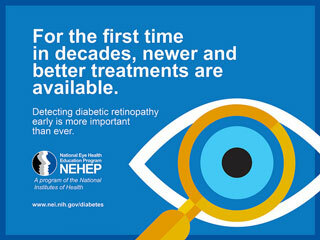 Diabetic eye disease, a leading cause of blindness, often has no early warning signs. Early detection, timely treatment and appropriate follow-up care are the only ways to prevent vision loss. As a health professional or community leader, you are well positioned to encourage people to take steps to protect their vision. Help spread the word about diabetic eye disease with our latest educational resources. Additional materials can be found on the Diabetic Eye Disease Education Program page. People with diabetes need to get a comprehensive dilated eye exam at least once a year and keep their health on TRACK to prevent vision loss. Spread the Word About National Diabetes Month! During National Diabetes Month, the National Eye Health Education Program (NEHEP) is encouraging people to spread the word about how persons with diabetes can protect their vision. Engage followers by posting the messages below and sharing a link to our National Diabetes Month infographics and animation.